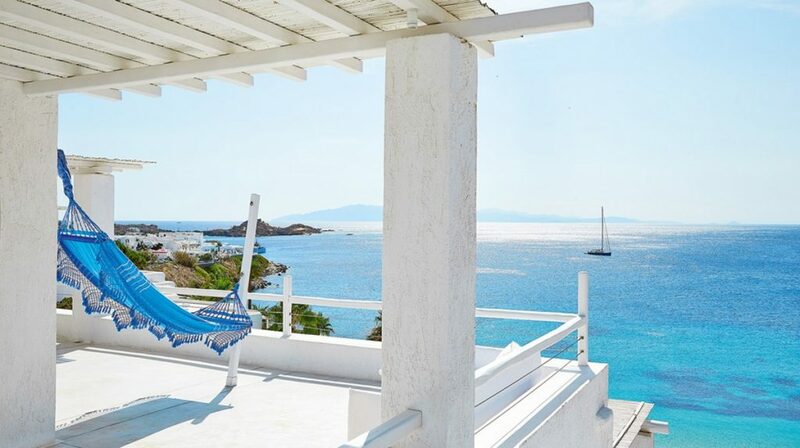 Nestled in the cosmopolitan island, discovered by jet setters, are the island bungalows and private villas of Mykonos Blu, thoughtfully designed to reflect the cubist lines of the Cyclades. Set on a low bluff overlooking the world-famous beach at Psarou, this dream resort floats on the edge of an Aegean fantasy, just like the unique infinity pool that seems to hover in the air. 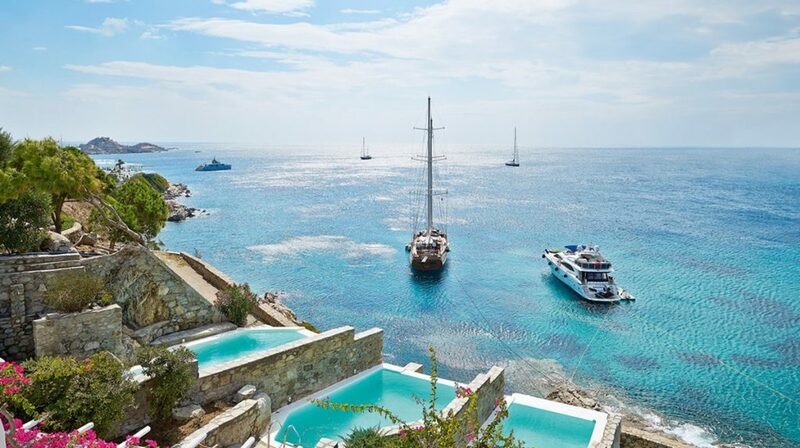 The Elixir Fitness Gallery and romantic bungalow suites with private pools make this one of the most sought-after hotels in the Aegean. 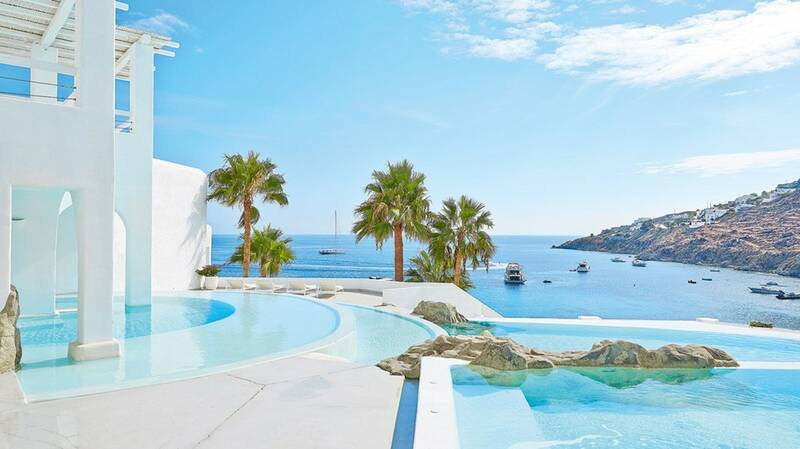 Of course, one of the main attractions is the proximity of (and refuge from) the pulsating nightlife of Mykonos Town. From Mykonos Airport to Grecotel Mykonos Blu Distance 3.2 km about 5 mins, Head south 2.2 km, Turn left to Platys Gialos 1.0 km. 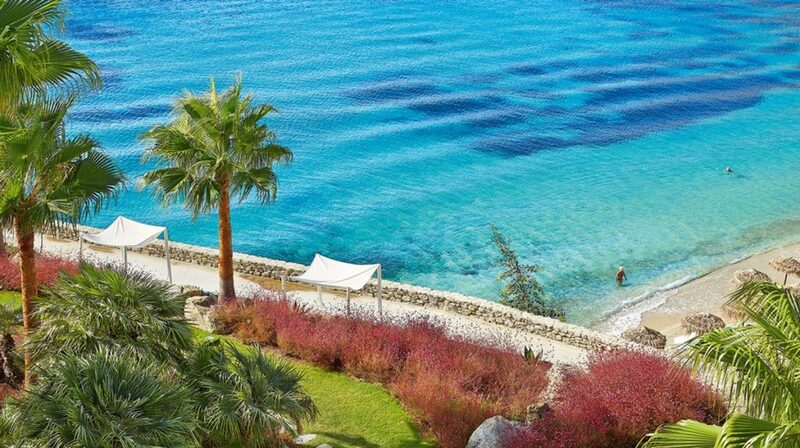 The Cycladic-style bungalows are clustered in small groups throughout the gardens. 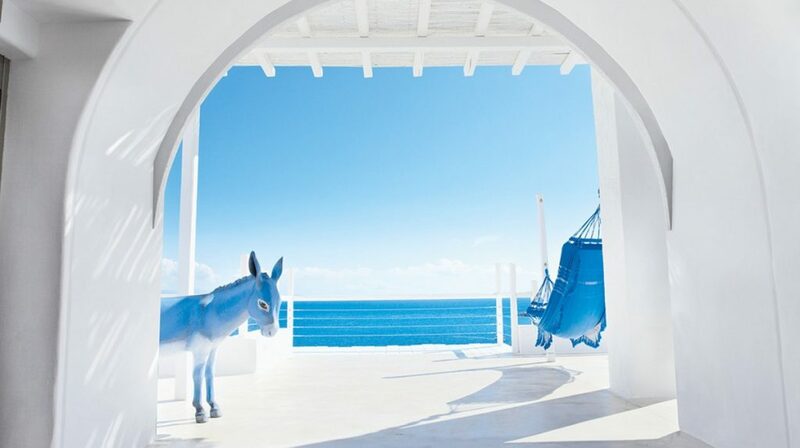 Aegean-inspired decoration, cool and stylish mirrors the island’s mystique. The romantic bed is draped in filmy voile is laid with cool white sheets and masses of soft pillows. 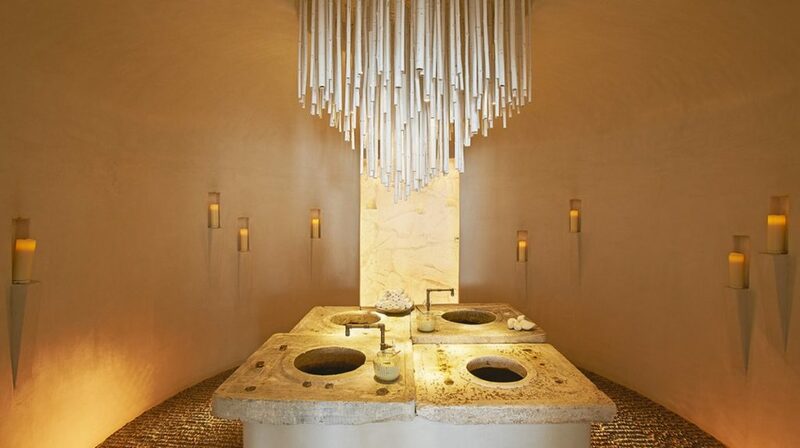 There are hand-sculpted light fixtures, while the sky-coloured stucco ceiling features a dreamy cloud effect. Private, en suite bathroom, which in most guestrooms features polished stone shower in a carved recess with inset phototherapy. The Cycladic-style bungalows are clustered in small groups throughout the gardens. Cool and stylish Aegean-inspired decoration mirrors the island’s mystique. The romantic bed, draped in filmy voile, is laid with cool white sheets and masses of soft pillows. There are hand-sculpted light fixtures, while the sky-coloured stucco ceiling features a dreamy cloud effect. Private, en suite bathroom, which in most guestrooms features polished stone shower in a carved recess with inset phototherapy. Island Bungalows in prime locations with direct sea views offer a selection of bright and breezy guestrooms designed as a cozy retreat from the jet set island’s whirring life. 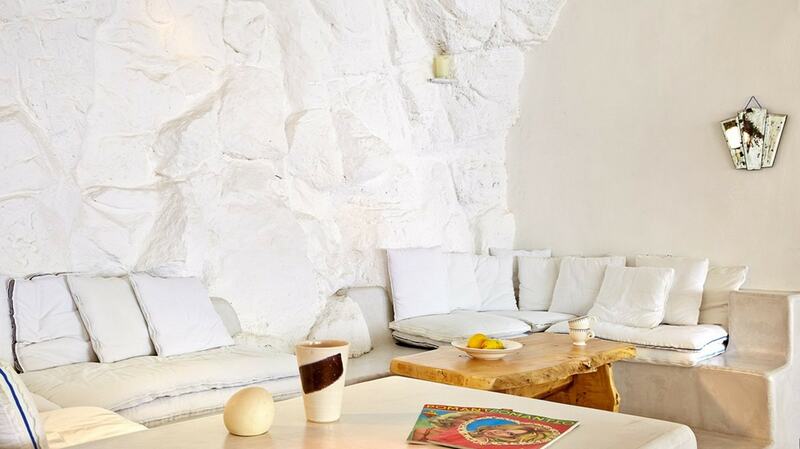 They combine the minimalist beauty of the Cycladic landscape with modern comforts. Revel in the luxury of custom furnishings, including hand-sculpted light fixtures and a stucco ceiling with cloud effects that extends the Aegean sky indoors. Curl up in bed under a gracefully draped canopy, which pulls closed into a private cocoon or back to reveal the brilliant Cycladic light. The bed is strategically positioned for maximum space and comfort, with a headboard of plump pillows you can arrange for reading or watching the flat-screen TV or just sharing a quiet snuggle. For private pampering, there’s a walled-off bathroom with a classic bathtub. Selected bungalows feature spacious bathroom with a recessed stone shower with inset phototherapy. Spacious accommodation in blue and white. 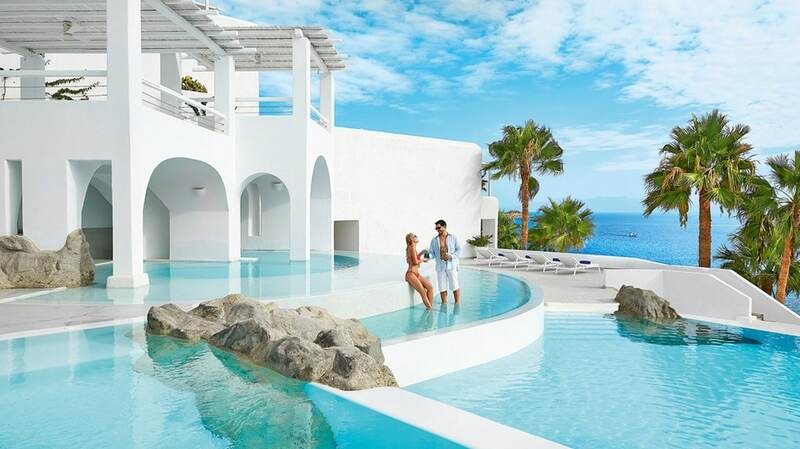 Sky-coloured stucco ceilings with cloud effects curve over the furnishings like a baldachin, or ornamental canopy, in typical Cycladic style. These rooms are a real home, a haven to relax, with sleeping, dining, and living areas within an open-plan design, furnished with many eclectic details. The white double bed, draped with sheer white netting, creates a cocoon-like atmosphere that invites you to forget time, to dream and relax. There are stone-carved ottomans with soft pillows, hand-sculpted light fixtures, and coffee tables. Spacious bathrooms feature double basins, bathtubs and separate polished stone shower in a carved recess with phototherapy effects. The outdoor living area is as spacious and as beautifully furnished as the bedroom and lounging areas. A private plunge pool completes the dreamy tableau. Waterfront bungalows claim prime locations with stupendous views of the Aegean’s infinite blue horizon where sky and sea meet. The décor reflects the aquamarine and sparkling azure colours of the sea, set off by the brilliant white that’s the hallmark of traditional Cycladic architecture. Cool and stylish, Waterfront Bungalows are romantic havens, with comfortable beds draped in voile and accented by soft pillows for leisurely lounging. Hand-sculpted light fixtures and billowing clouds created in stucco on the ceiling are some of the details that highlight the luxury of these premium accommodations. The spacious bathroom is designed for private pampering.